Description: Memory in Movement creates a dramatic visual experience by incorporating the motion of visitors. The memorial features 146 vertical fins, one for each of the 146 victims of the Triangle Shirtwaist Fire of 1911. As visitors move northeast on Greene Street, the fins collectively transform from a series of evocative images related to the Triangle Fire story into a poignant wall of names. For pedestrians moving in the opposite direction, the experience is reversed, with names transforming into powerful images. This effect evokes the dynamic power of memory, reminding us that it is through the ongoing worker safety movement that we remember. Through organized protest, these workers lives were remembered through labor laws and safety regulations that touch present generations. The memorial engages with viewers on an intimate scale at the street level, names gesturing upwards to contextualize the original architecture of the building. We envision that viewing the original and refurbished architecture, recognized as a National Historic Landmark, is a critical part of the experience of the memorial. The use of movement resonates with the dynamism of New York City, providing unique experiences for pedestrians, bikers, and cars within the site context of a busy thoroughfare. This is not a static memorial, but one that is dependent on the movement of New Yorkers and visitors—the pulse of the city. 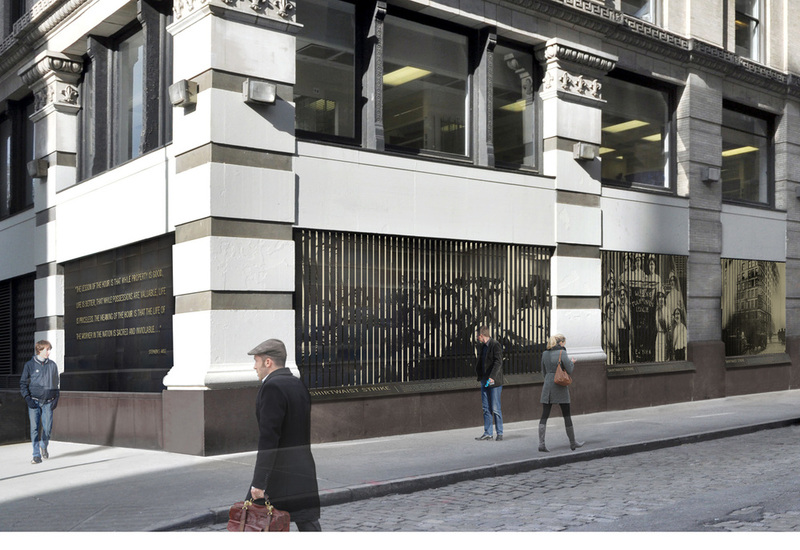 The vertical fins are made of light-colored alloy steel, evoking the finish of offset printing plates that were used in newspaper printing at the time of the Triangle Shirtwaist Fire. At the height of their influence, it was newspapers that reported the fire and the protest to the rest of the nation that lead to changes in labor laws. The back of each niche space is inset with darkened steel panels, helping to define and unify the memorial niche spaces. At night, upward lighting dramatically illuminates the images and names. Each of the five niches define and frame an image that captures a meaningful chapter in the Triangle Fire story: Working Conditions, Shirtwaist Strike, Triangle Fire, Aftermath, and Protest. At the lower edge of each niche, brief text interprets these meaningful chapters in the story. Dimensional text presents the viewer with a poignant quote associated with the Triangle Fire that both remembers and inspires activism, mounted on the Washington Place niche adjacent to the corner of the building. Memory in Movement reminds viewers that through movement that we remember, and through our societal response that we honor the lives of workers. Using the motion of viewers, this memorial design evokes the dynamic relationship between protest and commemoration. By remembering the tragedy of the fire, we honor the ongoing work of labor movements, safety laws, and social welfare policies to establish dignity and justice for all.